Can’t Verify Update Package, Can’t boot in Recovery Mode or not even use the MI flash tool to Install MIUI 7 or MIUI 8 ROM on Redmi Note 3. These are some problems that most of the Redmi Note 3 (Snapdragon) Users. 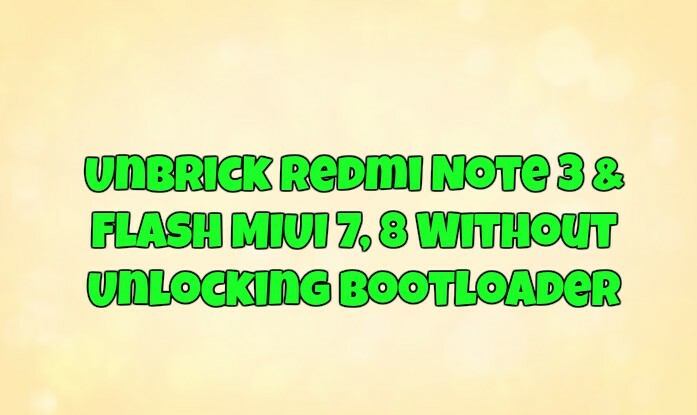 The main reason behind this is locked bootloader of Redmi Note 3, and you can’t flash any other ROM like Developer MIUI 7 on your Phone, and not even this you can’t also use the Mi Flash Tool to flash the MIUI 7 or MIUI 8 fastboot Rom on your phone (Unbrick Redmi Note 3). Now the unlocking bootloader is a long process, and you have to wait for 10 to 15 days to unlock the bootloader of Redmi Note. First, you have to get Permission for the MIUI team to unlock the bootloader and after then you follow the same on your phone. Here is the detailed guide which you can use to unlock the bootloader of your Xiaomi phones. But there is one more method which you can use on your phone and install your Fav MIUI 7 or MIUI 8 Fastboot ROM zip file on your phone without unlocking the bootloader. Here in this guide, we’ll show you how you can Flash MIUI on the Locked bootloader. This guide is also working on Bricked Redmi Note 3 to Unbrick Redmi Note 3. Please be noted I will not take any responsibility for anything happened to your device. Important: – Before flashing, it is advised to take the backup of data and make sure that your phone battery is charged enough. All credit goes to the MIUI Forum Senior Member Muz_paray . So let us take a look how to that. a) Download Fastboot_edl zip file here on your desktop. This will help you to boot your Redmi Note 3 in DOanload Mode. Yes, No fastboot mode, you need to boot your phone download mode to flash the MIUI 7 or MIUI on locked bootloader. b) Download the Latest MI Flash Tool v20160401 from Here. Note: This MI Flash works with 64-bit Windows only. d) Battery Above 60% on Redmi Note 3. Step 1. First Disable Driver Signature on your Windows PC. Step 2. Extracted all the Download folder on your desktop ( Fastboot_edl, Fastboot ROM file, and MI Flash Tool). Step 3. If you phone is bricked and nothing comes on the screen then boot in fastboot mode. If your phone is working then, you have to boot your phone in Fastboot mode first. Switch Off your phone first and wait for 10 seconds. Boot the phone into FastBoot mode by holding both Volume Down and Power buttons until the bunny appears. Step 4. Now connect your phone to the PC with USB cable and open the Fastboot_edl that you download from the above mention links. Step 5. Double-click the “edl” (edl.cmd) file. If the bunny disappears, your phone was rebooted and now should be in EDL mode (Download mode). Step 6. 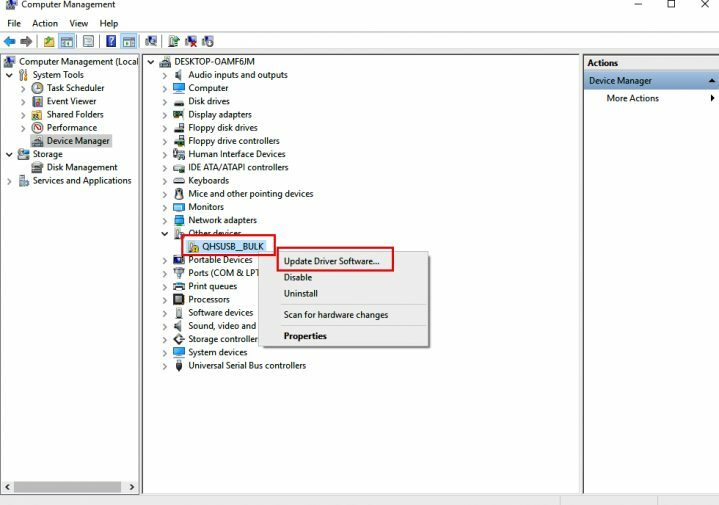 Now Open the Device Manager on your Windows PC and Phone will be detected as QHUSB_BULK. Right, Click and choose Update Drivers. Step 7. Choose Browse My Computer for Driver Software. Choose the Path of Xiaomi Folder. Most of the users will find it like this. Note: If Folder don’t exist, Install MI Flash tool(Link Above on Step b) first. Step 8. Choose Install this Driver Software anyway. And let the installation process done. Step 9. Once the drivers are installed. 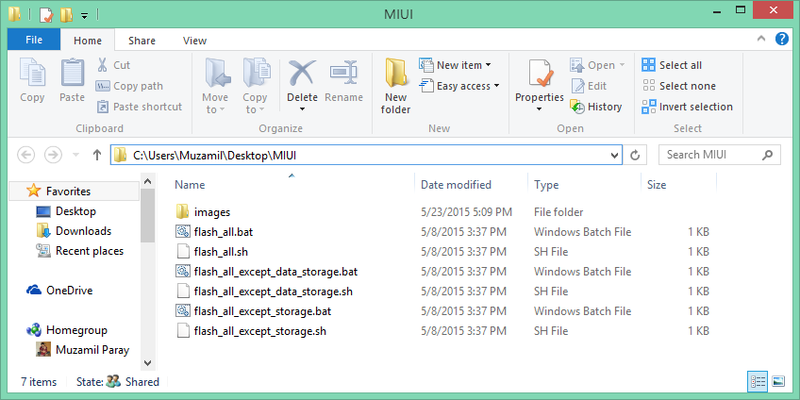 Run the MI LFash tool on your Windows PC. Step 10. Now Click on Browse button and select the extracted MIUI Fastboot ROM folder in which all you files are saved like images, Flash all, etc. See the screenshot below. Step 11. Press Refresh button to see your device in flashing tool. After pressing refresh button, you will see the connected device. Step 12. Choose Flash_all option and Click on Flash and it will start a process. Step 13. Once flashing process completes, Unplug the cable from the phone and hold the power button for few seconds until it Vibrates. The Device will start, wait until completion, it can take up to 10 Minutes. THat’s it now the MIUI 8 or MIUI 7 Rom is successfully installed on bricked Redmi Note and You flashed the ROM without unlocking the bootloader. I have connected as u said the drivers are properly installed. the device is shown in device manager while in edl mode. But the MI flash tool show nothing when i choose the package and click refresh button. My Device is stuck on Mi logo screen and android dots are constantly moving after doing above mentioned procedure. big thanx to you sir. your method really save my day.